When planning on the strategy and layout for building an optimized storage and distribution center, companies tend to first contemplate and compare the characteristics of different styles of shelving and racking systems to put in their warehouse. However, in this particular case, the racking system is what actually forms the warehouse itself. Rack supported warehouses are structures almost entirely composed of high density storage systems which also function as the actual structural support for the facility. What is a rack supported warehouse? If you’ve never seen a rack supported warehouse, picture a structure completely formed by racks used in selective systems and then covered over with a unique and highly resistant shell. However, in this case, the racks are designed to be extremely resistant in order to be able to withstand the weight of the ceiling while simultaneously supporting the walls. In addition, automated and semi-automated systems are responsible for inventory handling. 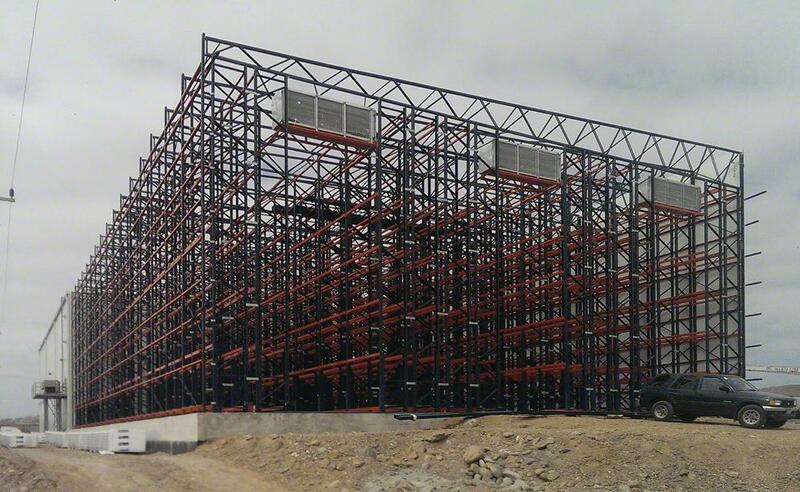 When designing a self-supported structure with the goal of obtaining maximum height, it is recommended to utilize clad-rack systems in the main warehouse structure and then rely on traditional construction methods for building a lower structure for the other spaces required for the processing of orders. Keep in mind that any warehouse can be designed with a rack supported structure, however the value of this architecture is most appreciated in structures over 43 feet in height (although warehouses can be built to over 148 feet high). In order to increase the cost-effectiveness of a project of this magnitude, it is ideal to take advantage of the maximum height permitted by local regulations. Is there a legal limit which would potentially prevent you from constructing up to your desired structural height? No need to worry. Uniquely designed pits can be excavated for customized rack supported buildings which comply with the needs of your storage facility. Are you located in an area prone to natural disasters? Are you in an area which must periodically be prepared for earthquakes or hurricanes? These structures are highly resistant due to their unique architecture which allows for a diffusion of energy throughout the internal racking systems. However, the immense size and shape of rack supported warehouses means that special circumstances should be taken into consideration. Extremely strong wind gusts and the accumulation of rooftop snow can be hazardous to the stability of the building. 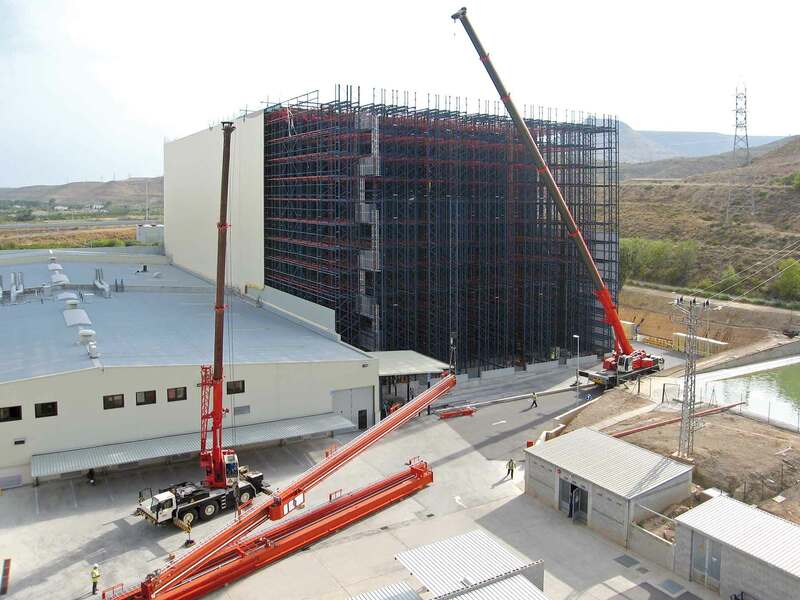 Local seismic activity should also be studied before you make a decision on the final design of your structure, as was in the case of one of the largest automated rack supported warehouses in Europe which Mecalux designed for Hayat Kimya in Turkey. Why do I want a rack supported building? Completely optimized space utilization and reduced footprint. Allows for rapid construction of facility. Resistant to extreme weather and seismic conditions. Shorter time to obtain return on investment. Can be designed for cold storage with double slab insulated flooring. Rack supported warehouses are not necessarily the ideal solution for every distribution center, however for many they prove to be above and beyond the best choice. The remarkable Fruvemex refrigerated warehouse is an ideal example of the beneficial applications rack supported buildings have to offer. It was designed with a carefully finished exterior that minimizes the overall landscape impact and ensures the best thermal insulation for stored goods. The different modules in the facility are connected in such a way that the refrigeration system is continuous. Thanks to the design of this new rack supported warehouse, Fruvemex has been able to reduce storage costs by optimizing their space as much as possible. Consequently, they can control the large power expenditure that comes with these types of cold storage warehouses.